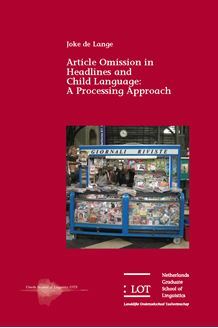 This study compares article omission in newspaper headlines with article omission in child speech in Dutch, Italian and German. It presents the results of a corpus investigation based on a database collection of one thousand head­lines for each language. In addition, it presents and analyzes the results of the first experiment ever with newspaper readers giving judgements on whether or not articles can be omitted in a variety of linguistic contexts in headlines in their language. The investigation of article omission in child speech has been based on files from Dutch, Italian and German CHILDES corpora. The results of the study show that there are both crosslinguistic differences as well as clear and interesting similarities between the patterns of article omission in the various groups of speakers. It is argued that the observed differences and similarities offer evidence for the claim that both children and adults omit articles because of the processing cost necessary to retrieve articles from the article set. The more difficult the selection process, the more processing resources are required for the selection of an article. An information­theoretical measure, the relative entropy value, is used to calculate the level of complexity of this article selection process. It is shown how the differences in relative entropy value of the article sets in the three languages can account for the observed omission patterns. This study is of relevance to researchers in the fields of first language acquisi tion, psycholinguistics, text linguistics and communication and information sciences.